Raised bed gardening means growing plants in soil that's higher than the ground. Most commonly, this is done with some type of enclosure or frame made of wood, stone, or even bales of hay or repurposed material like old dressers. Raised beds can be as humble or creative as you like. The initial cost in getting your raised bed set up will depend on how elaborate you make it, but once in place, raised beds are no more expensive to maintain than traditional gardens, and they offer a lot of benefits. It's not uncommon to include plants in containers on a patio, but you could just as easily incorporate a raised bed into the structure of your patio, with bricks or lumber. This provides a permanent spot for perennial plants to settle in and mature. The herb garden pictured here, designed by Miles Garden Design, certainly makes it easy to add extra seasoning to your dinner. Another great advantage of raised bed gardens is that they sit well above the underground frost line, so the soil warms up faster in the spring and you can start planting sooner. If you want to keep the soil toasty all summer long, consider building the walls of your raised bed out of some type of metal, like this sheet metal raised bed idea from Garden Beds Design. Metal will ensure all the heat from the sun is retained in the soil. Sheet metal is easy to form into shapes and a great way to provide the heat needed to grow Mediterranean plants like sage and lavender. Using a raised bed for growing vegetables allows you to control the soil quality and prevent it from becoming compacted. Vegetable roots can grow unimpeded. The beds do not have to be very high to benefit from being in a raised bed gardening. Even the 6 to 8 inches of these vegetable beds shared by Patrick on Flickr are enough to improve water drainage. This garden is also employing Mel Bartholomew's Square Foot Gardening technique, to make layout easier and amp up the harvest. Spiral gardens, like this herb garden at Mill Creek Gardens, are a popular permaculture technique. They increase the amount of usable planting area without taking up more ground space in your garden. You can easily build them out of stone, brick, wood, or simply by piling up soil. The unusual shape and swirl of plants make for an eye-catching focal point in your garden. Herbs are the plants of choice, but you can grow anything in a spiral. The plants are all easily within reach. With a little pre-planning, you can create a multi-season vegetable garden. Raised beds let you control the growing conditions in your garden and keep vegetables out of view of hungry animals. If you build your hoop house right on top of the raised bed, like this vegetable bed from Oregon State University, you'll be prepared for any weather, giving you a headstart in spring and a garden that can handle frost. The university even offers the instructions to build your own. Raised beds are terrific options for yards with steep slopes. By building up the beds at their lowest sections, like these stone raised beds that cultivar413 photographed at Wave Hill, you can create the illusion of a level garden. You can see that gardening in a raised bed need not limit your options. Make your beds wide enough so that you can still have a layered flower garden with a border of shrubs framing the back of the garden and plenty of room for perennials that will provide colors, textures, and edge softening drapes. Beautiful Faux Creations demonstrates one of the easiest ways to create raised bed gardens. Simply fill animal feeding troughs with some good soil and start planting. No assembly required, but be sure to drill some drainage holes in the bottom, before you add the soil. The metal gives the garden an industrial look and helps warm the soil in the spring. Depending on what you chose to grow, the beds may need a bit of extra water during the hottest part of summer. Raised bed gardens can be designed to fit just about any space. With a little creativity, you can create an entire garden area. This multi-level raised bed built with simple straight lines by Peter Donegan Landscaping comes complete with a potting shed and night lighting. Add a bench section, like the one at the end of the front bed, and you have seating for the outdoor dining area. As the plants fill in and the wood weathers, this garden will take on a natural, rustic appearance. Gardening on a trellis or arbor in a raised bed makes it even easier to harvest vegetables and keeps them cleaner than if they were sprawling on the ground. Vertical gardening allows you to grow more plants without taking up more space. 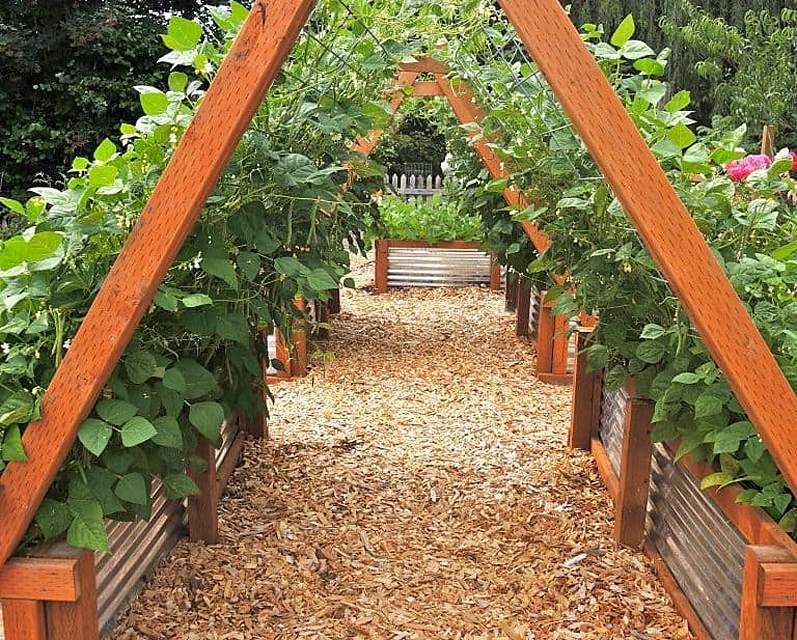 Family Food Gardens shows that whether you grow flowering vines or sprawling vegetables, this garden teepee trellis creates a living arbor that gives the vines plenty of access to sunshine without shading out the plants in the raised beds below. Yours needn't be this elaborate. You can create an A-frame by leaning two bamboo poles together, tethering them and stretching garden netting across. Gardens in small spaces can often feel cluttered and untended. In contrast, the raised beds lining this pathway garden by Gardening Choice provide architecture and four seasons of structure to this small garden. You could create these beds for any shape garden from bricks, pavers, or composite decking material. Not only do they define the space, but they also make it seem larger by breaking up the view. All that and they also provide an extra seating area in a shady part of the garden. 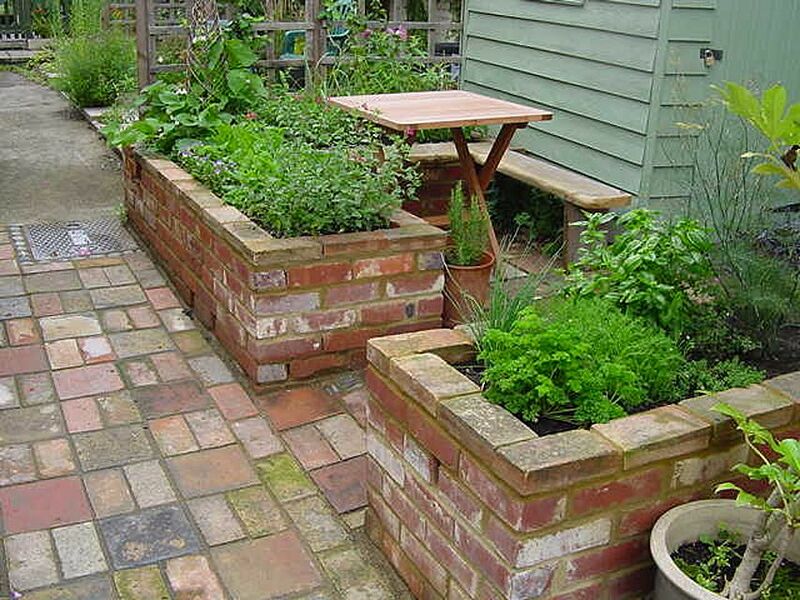 There are many ways to build raised beds out of recycled materials and using concrete blocks is one of the most popular. This gardener at Home Designed Inspired took it one step further and personalized their block garden with a little colorful paint. Older cinder blocks may contain fly ash, the "cinders" that remain from burning coal. Whether or not this is unsafe to use around edible plants is still being debated. However, new blocks are made from concrete. They will feel substantially heavier than older cinder blocks and are deemed okay to use for a vegetable garden. Careful though–they will leech lime, which can raise the soil pH. Raised beds know no limits. This multi-tiered version from Home Stratosphere looks like a pagoda or maybe a fountain. Once it is filled with flowers, it may be hard to see the beautiful wood frame supporting them, but it will look good all year long. In fact, you could even decorate it with seasonal greens and decorations throughout the holidays and year round. You could build your own version with wooden frames or by layering successively larger containers by passing rebar or a metal pipe through the drainage holes and separating them with something like washers. Look around your storage areas or check out some salvage shops for items that would make attractive, easy-to-assemble raised beds. The gardener at Life at the Cottage created her kitchen garden from some vinyl garage door panels attached to resin reinforced vinyl fence posts and finials. It's not just attractive, it is very low maintenance, requiring no waterproofing or painting, and will last far longer than most wood products. Rather than simply terracing the entire area of a sloping yard, you could create a garden at eye level. Maria Michelle captured this seating area that was kept at the original level of the hillside. A stone patio and retaining walls create an alluring garden room surrounded by raised beds, perfect for sitting and relaxing with a view or sitting on the wall and gardening. This would require a fair amount of soil removal and stonework, but you would enjoy it for years. Is there no end to the uses for milk crates? This milk crate raised bed featured by Helen Babbs on The Edible Aerial Garden is not just easy to set up, it can be configured into any shape you like and could even be portable. Just pick up a crate and move it closer to the kitchen. There is no need to drill drainage holes and when you need to change the soil, you can just lift the crate and dump it in the compost pile.